I try not to even read the comments sections on any newspapers, anymore, considering the level of maturity of the majority that response is incredibly low. If you ever need a laugh or something to get angry about check out the comments left at the websites of the Detroit Free Press and Detroit News websites. They are some of the most nasty, racist comments you'll ever read and prove out comfortable people feel saying what they really feel on the internet. The LSJ comments are usually tame in comparison. What I really like is how this will be the first building on North Campus to open directly unto Grand River Avenue. I always wondered why MSU built itself to turn its back to East Lansing. It's really symbolic of the relationship (or lack of) between East Lansing and MSU which pretty much functions as its own city under the state constitution. Jared, do you have any current updates on The Museum Place, or pictures/renderings? Thanks! Well, the Museum Place has seemed to be pushed out of the spotlight for a while, probably due to budget contraints with getting commercial tenants, and also with the relocation of current tenants. Now that (scene) Metrospace has moved, all of the tenants of the affected properties have been relocated. The Request for Proposal for Lot 1 in East Lansing mentioned that they expect construction for the Museum Place to begin within the next 24-36 months, and previous speculation was that the buildings would be torn down this summer, and the land would be used as a gravel parking lot until all funding and support could be lined up to start construction. I don't have any new renderings since the extremely modern design was unveiled. I think that design (the swiss-cheese building) has significantly changed, and I would expect something not so futuristic looking to be built. The newest design for this project, on the property listing it says construction is anticipated to begin in spring/summer 2008. It's too bad that the building on the People's Church parking lot is no longer planned, along with the redesign of the streets. I like the public open space at Abbott and Grand River though. Wow...not an improvement, at all, in my opinion. I hope the renderings on Strathmore's pages go through. It looks like a quality building, they are using limestone and looks modern but not too radical like it looked before. The other buildings that they plan to build look nice too, but is there enough market demand for these upscale condos and apartments? Maybe if a new corporation moves to the area or more graduate school students move to this area rather than various scattered apartments in the area. 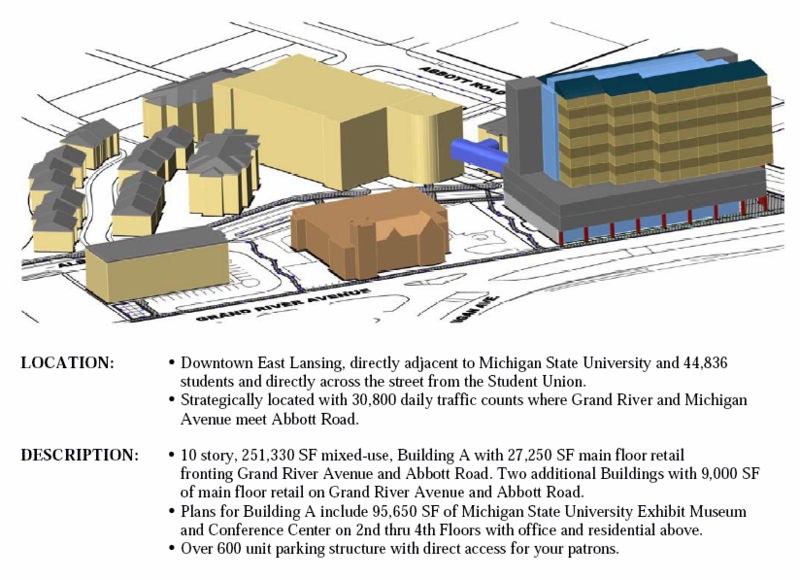 This, combined with the East Village project will definitely change the face of East Lansing. Local residents still mad, as evidenced by this State News article, about City Center II development. Resident/planner feuds are likely to go a long way in delaying this project.